Photo courtesy of Montana Historical Society. 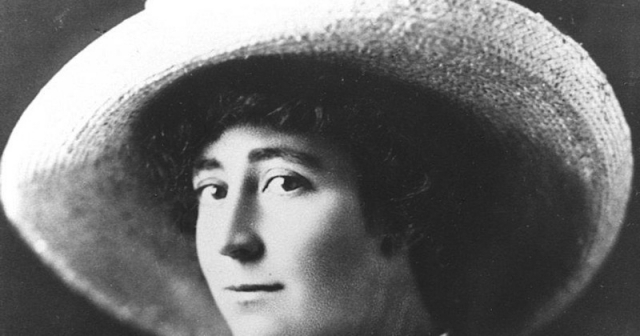 Montana Congresswoman Jeannette Rankin was the first woman elected to the US House of Representatives, and to even be elected to U.S. federal office. Before that, she was highly instrumental in women getting the right to vote before World War I. Bear in mind, it wasn’t until 1920 that the 19th Amendment passed, guaranteeing it for the entire nation. Writer-actress J. Emily Peabody embodies the time and essence of the woman in a stirring solo performance, Jeanette Rankin: Champion of Persistence. A strength in Peabody’s writing is that she organically reveals how Rankin never let the roadblocks set up against her by men in power positions bias her against men. She strove mightily against the exploitation of men in perilous workplaces or the battlefield. And Peabody portrays this touchingly. Rankin, a Republican, actually voted against the U.S. going to war in both World War I and World War II. Directed with a vivid sense of history by Roberta Cullen. Note: 15 states, most of which were west of the Mississippi River, granted women full voting rights before 1920. Four territories, all western, did the same in the 1800s. Alaska territory followed suit in 1913. Twelve other states gave women the right to vote for one office—that of the president—prior to the 19th Amendment.